Reynolda Presents ‘Hopper to Pollock’ Showcasing 50 Years of American Modernism Works of art from nearly every major American artist of the first half of the 20th century will be on view at Reynolda House Museum of American Art starting Friday, Feb. 15. “Hopper to Pollock: American Modernism from the Munson-Williams-Proctor Arts Institute” will include 40 masterpieces of modern art from the collections of two pioneering art collectors. Reynolda is presenting the exhibition in English and Spanish, the first time it has done so with a major exhibition. The bilingual exhibition follows the launch of the museum’s bilingual app, Reynolda Revealed, in June. Both initiatives are part of the museum’s commitment to evolving with its North Carolina audience, which is among the fastest growing Latino/a populations in the United States. “Hopper to Pollock” will be on view at Reynolda through May 12. The exhibition showcases paintings and drawings by 32 celebrated American artists including Edward Hopper, Jackson Pollock, Willem de Kooning and Mark Rothko, who were responding to the 20th century’s volatile, exciting growth and scientific progress, as well as the devastating horrors of economic depressions, political uprisings and world wars. “The works of art in the exhibition are both wide-ranging and iconic,” says Reynolda Curator Allison Slaby. “Visitors will immediately recognize the drip-painting style of Pollock and the abstract forms of Rothko, but may be surprised by an Edward Hopper landscape, an artist who is better known for his images of urban spaces.” The exhibition was formed from works of art once in the private collection of Edward Wales Root (1884-1956), son of Secretary of State Elihu Root and a pioneering collector of modern American art. In 1953, the Metropolitan Museum of Art displayed more than 100 works from Root’s holdings; it was the first private collection of contemporary art ever exhibited there. Four years later, Root bequeathed a majority of his collection to the Munson-Williams-Proctor Arts Institute in Utica, N.Y., near his home in central New York. An earlier version of the exhibition has been on view at other museums, but this will be the first installation to include additional works from another private collection. Reynolda House curators are including a selection of American modernism from the private collection of Reynolda’s founder and the visionary behind the museum’s collection, Barbara Babcock Millhouse. Opening Weekend Kicks off with Beer Release, Food Truck“Hopper to Pollock” opening weekend kicks off to the public on Thursday, Feb. 14 at Wise Man Brewing with the release of a craft beer brewed especially for the exhibition season. The Winston-Salem brewery’s “Intimate Impressions IPA” is a hops-forward New England Session IPA with citrus and fruit aromas. 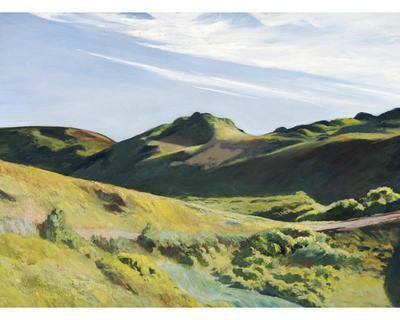 The beer gets its name from an interview with Edward Hopper in 1959 where he said: “My aim in painting has always been the most exact transcription possible of my most intimate impressions of nature.” A Hopper landscape painting “The Camel’s Hump” is featured prominently in the exhibition. At the Valentine’s Day release event for “Intimate Impressions,” vouchers for one free admission to “Hopper to Pollock” during opening weekend, Feb. 15, 16, or 17, will be available to the first 50 customers. “Intimate Impressions” also will be available in cans at Wise Man Brewing and at museum events throughout the spring. Visitors to “Hopper to Pollock” on opening weekend, Friday, Feb. 15, and Saturday, Feb. 16, can purchase lunch from a food truck on-site or enjoy food in the restaurants of nearby Reynolda Village. Exhibition Season Events Reynolda will welcome the public throughout the season for lectures, a free community day and two nights with extended hours where the regular admission fee is waived. Information and tickets for all events are available at reynoldahouse.org/hopper. On Saturday, March 2 at 2 p.m, scholar Michael Leja will discuss how artists working in unconventional, modernist styles often turned to writing to help explain their art. “The Lure of Writing: Modernist Artists in the Medium of Language” will focus on the relationship between words and images in the work of several artists, including Georgia O’Keeffe, Edward Hopper, Aaron Douglas, Jackson Pollock, and some of their contemporaries. Leja is the James and Nan Wagner Farquhar Professor of the History of Art at the University of Pennsylvania. Tickets are $15 or $8 for members of the museum and students. On Thursdays, March 7 and April 18, the museum will stay open until 8 p.m. and waive its admission fee in exchange for cash donations from 4:30-8 p.m. Called Pay-What-You-Wish Thursdays, the informal evenings welcome guests for music, art-making, light refreshments and a cash bar serving “Intimate Impressions IPA” and other beer and wine. On Tuesday, April 23 at 6 p.m., David Lubin will offer insight into Jackson Pollock’s drip paintings in a talk titled “Jackson Pollock and His Times.” Lubin is Charlotte C. Weber Professor of Art at Wake Forest University and the author of several books including “Shooting Kennedy: JFK and the Culture of Images,” which won the Smithsonian Institution’s Charles Eldredge Prize for “distinguished scholarship in American art.” Tickets include a reception and are $15, or $8 for members of the museum and students. On Saturday, April 27, Reynolda hosts its annual, free community day for all families. Admission to the museum, including “Hopper to Pollock,” is free 9:30 a.m.-4:30 p.m., and activities and games will be available 11 a.m.-3 p.m. Reynolda House is grateful for support of “Hopper to Pollock” from lead sponsor Womble Bond Dickinson; an anonymous contributing sponsor; exhibition partners Anne and Bruce Babcock; Joseph P. Logan; Dalton Ruffin; Taylor & Taylor, Attorneys at Law, PLLC; Verger Capital Management; and Janie and J.D. Wilson. Additional support provided by The Charles H. Babcock, Jr. Arts and Community Initiative Endowment. About ReynoldaReynolda, in Winston-Salem, N.C., is a rare gem among the nation’s arts and cultural institutions and historic greenspaces. The 50-year-old museum at the center of Reynolda’s 180 acres, Reynolda House Museum of American Art, presents a renowned art collection in a historic and incomparable setting: the original 1917 interiors of the country manor of R. J. Reynolds. Spanning 250 years, the collection is an uncompromisingly selective one, a chronology of American art, with each artist represented by one work of major significance. Highlights are: Albert Bierstadt, Mary Cassatt, William Merritt Chase, Frederic Edwin Church, Stuart Davis, Martin Johnson Heade, Alex Katz, Lee Krasner, Jacob Lawrence, Georgia O’Keeffe, John Singer Sargent and Grant Wood. The collection was assembled by the unerring eye of Barbara Babcock Millhouse, granddaughter of R. J. and Katharine Reynolds. The Reynolda experience includes a free app called Reynolda Revealed; touring exhibitions in the museum’s Mary and Charlie Babcock Wing; formal gardens, conservatory and walking trails of Reynolda Gardens; and more than 25 of the estate’s original buildings repurposed as shops and restaurants in Reynolda Village. Reynolda, located at 2250 Reynolda Road, is adjacent to Wake Forest University. For more information, please visit reynolda.org. Connect at facebook.com/rhmaa and @CurateReynolda.